Summary: Camp At Your Own Risk! Welcome to camp – Camp Dracula, as Jeep Holmes jokingly calls it. [Wing: JEEP.] Jeep may be joking, but he isn’t laughing. He can’t take this weird new summer place! Never mind that the counselors always wear dark glasses and the activities are all at night. What bothers him most are the other campers, a bunch of sickly-looking creeps who like to keep bats in the bunks! Why did his parents send him to this horrific place? Will Jeep make it through the summer without going batty? And now we get back into the chronological order of things (at least for a little bit), but hey, this is a vampire book, and what goes better with February than vampires? This is the first book in the series to take place outside of the school and Grove Hill, and the first summer-themed story. 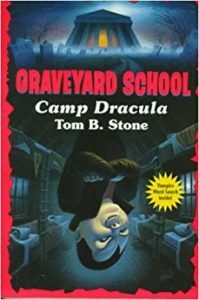 I mentioned there were only two camp-related books, and it’s interesting it would involve vampires since they’re nocturnal by nature and camp tales take place mostly during the day. This is also the first to have a protagonist who can be genuinely grating on the reader. It’s admittedly one of the few books I haven’t reread as much. But you’d be surprised at the use of Dracula references.